The Render K is the latest machined pen to hit Kickstarter, built to take advantage of the world-famous Pilot Hi-Tec-C refill. I have been lucky to be able to test drive a prototype of the Render K for the last few days, so let me explain a few differences this pen has over previous Kickstarter projects. The Render K is manufactured in the US by KarasKustoms. I have chatted with Dan from KarasKustoms via email several times and he made it clear: the guy selling you the pen is the same guy manufacturing it in his shop in Mesa, Arizona. This is one of the reasons I was able to get an early prototype. The Kickstarter page is full of details, drawings, and videos of the Render K for you to check out, but let me tell you what sets it apart. First of all, the design is portable. I backed both the Pen Type-A and PHX-1 projects and can’t wait to get both of those pens. The thing is, neither one is going to leave the house with me. 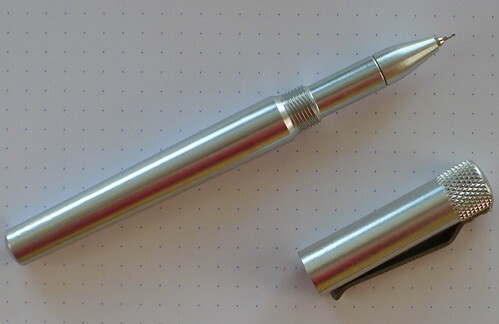 The Render K is based around a standard pen design. Standard length, standard weight - hey look - a pen clip! Toss it in your shirt or pants pocket and you are ready to go. 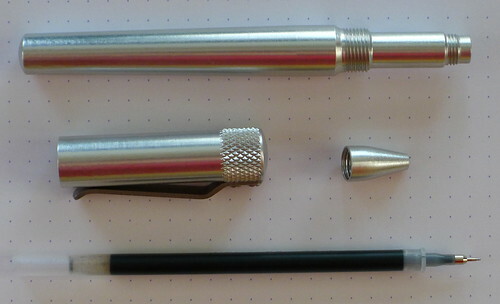 Another unique feature is the ability to swap out the Pilot Hi-Tec-C refill for a Parker compatible refill. KarasKustoms provides a spacer and a spring to make this happen, giving you more flexibility and choice in your ink. I have been really happy with my prototype so far. I included a few pictures so you can see it for yourself. Dan made it perfectly clear that the pen I have is not in its final production state, so keep that in mind when looking at the photos. My untrained eye is hard pressed to find any flaws. Thanks to Dan and KarasKustoms for giving me an early look, and don’t forget to check out the Render K project on Kickstarter. Posted on December 16, 2011 by Brad Dowdy and filed under Kickstarter, Render K.